Gábor Varga is a Hungarian dancer, and performer who began his career as a folk dancer. Between 1995 and 2000 he studied at Talentum International School of Dance and Musical Art in Budapest, after which he was accepted to P.A.R.T.S, the Anne Teresa De Keersmaeker school in Brussels. During his time in Brussels, Gábor participated in works of many renowned choreographers including Anne Teresa de Keersmaeker, David Zambrano, William Forsythe, Michèle Anne De Mey, Mette Ingvartsen, Thomas Hauert, just to name a few. Many of these works toured with Gábor all around the world. Since moving to Geneva, Switzerland where besides working with Cie Gilles Jobin, Cie Alias/Guilherme Botelho, and Cie József Trefeli, Gábor has become involved in administration and production for artistic projects. 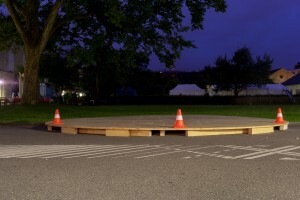 Dieser Beitrag wurde unter Artists 2015 abgelegt und mit Art, Contemporary art, der Längste Tag, Dorothea Rust, Gabor Varga, Irene Müller, Jozsef Trefeli, Kunst, Performance, Performance art, Performancekunst, the Longest Day, Zürich, Zeitgenössische Kunst, Zeughaushof verschlagwortet. Setze ein Lesezeichen auf den Permalink.